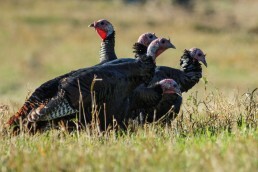 By the time July arrives in the Midwest, the full flush of summer loads watery systems to the gills with vegetation and life in the form of insects, small fish and other staples. 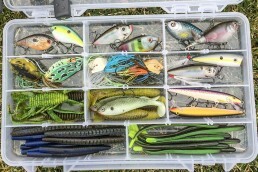 Bigger predator fish have nearly limitless options when it comes to where they can set up shop or what expanse they might roam.Your baits and lures compete with a mother lode of the real thing, which compounds the challenge of finding and triggering fish. It’s a time of plenty. A time to put puzzles together. 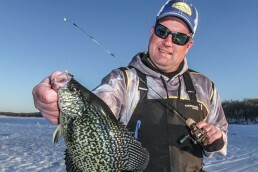 Amid the cornucopia, to help funnel your energy into successful summer days catching bass, walleyes, and muskies, we leaned on three Northland pros and shook ‘em down for their top tips. As versatile as anybody who’s ever run a boat down a breakline, Gary Roach, Mr. Walleye, is perhaps best known for his mastery over the classic live-bait rig. A hook, line, and (slip) sinker, baited with a minnow, leech, or nightcrawler is presented to fish until one bites. A version of this rig is named for him, the Roach Rig, though in recent times it has evolved to become separate components you mix and match to tie rigs to your own specs. Eric Naig with a monster midsummer muskie. 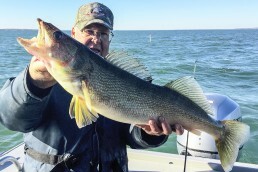 Here’s Roach on how to catch walleyes with this time-honored approach. MidWest Outdoors: With so much focus on plastics, crankbaits, and other walleye stuff, you still spend lots of hours pulling a live-bait rig, don’t you? Gary Roach: You bet. These days, everybody ties up their own. We have the Roach hooks, Roach sinkers, bottom bouncers like the Slick Stick, and you rig it up the way you like it. I’ve always done my own, anyway, because I like to use lighter leaders. I use 6-pound-test, and a lot of the standard stuff used to be 8-pound-test. And I really like the red hooks, the Roach red hooks. MWO: What line do you use? 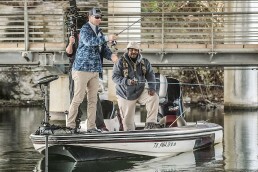 Roach: Northland Bionic camo line. It has a blend of colors, like camouflage. And when the fish are finicky, I go down to 4-pound-test. MWO: One thing that always comes up when we talk about fishing with a Roach Rig is how long to give the fish before you set the hook. What are your latest thoughts on that? Roach: You don’t need to give him a half-hour to eat a leech. You get the bite, you drop the rod tip back to him, and set the hook. You don’t wait and count to 20, or 30, or whatever they say. When people let the fish have it that long, that’s why these fish are swallowing the hooks. You don’t need to do that. Hook ‘em in the lip. MWO: What is the exact process you go through as you decide when to set the hook? Roach: Well, think about this: sometimes when the fish bites, he doesn’t go sideways, or away from you, but he heads toward the boat, underneath. So what you have there is a great big curl of line, with the sinker out there and the line coming toward you. So, regardless what direction the walleye goes after biting, what I do is crank up nice and slow until I take up the slack, then crank really fast and set the hook at the same time. If the fish came toward you, you have to get rid of that great big circle of line out there, a U joint I call it. Tighten up, crank on the reel, and set. MWO: And with the Roach Rig, you don’t set the hook hard, right? Roach: No, it’s a sweeping set. That little hook is so sharp, you don’t have to set it hard. But once I have it set, I give it one more little tug, you know, just to snug it up in there. You’ll know if you don’t get it tight enough before you set, because when you sweep, you won’t feel ‘em. You’ll have all this slack out there.Don’t give ‘em so much time. 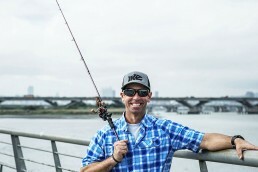 When I get the bite, a lot of times I just drop the rod to ‘em and reel it up and set. I don’t give ‘em hardly nothin’. MWO: Another big question is how long the leader should be. 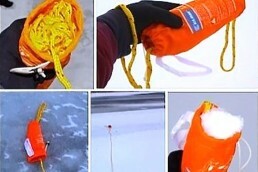 Sometimes it’s called the snell, because the hook might be attached with a snell knot. Sometimes people just call it the distance between the weight and the bait. What are your latest thoughts on leader length? Roach: When I go to Mille Lacs, the shortest rig I use is 7 feet. All the way to a 9-foot leader. MWO: So are you saying that you seldom use a leader shorter than 7 feet? Roach: Oh, yeah, sometimes I do; it depends on the fish. When the fish are really active, and you’re using live bait, especially when you’re using minnows, sometimes I’ll shorten it up to like 2 feet, so the minnow can’t get away from the fish. We’ve won a lot of money in tournaments by using short snells, and not even dragging it, just holding it still, so the minnow can’t get away from the fish. 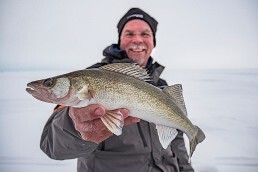 When a walleye starts after the minnow, you can imagine the fish is chasing this minnow, and the minnow is flipping around on a 4-foot snell, or longer, and pretty soon the fish will just leave it alone, saying, ‘I can’t catch that minnow, so I’ll move on.’ Shorten it up and the minnow doesn’t get away from the fish. MWO: You wouldn’t use such a short snell with a nightcrawler or leech, right? Roach: No, my average is about 4 1/2 feet, something around there, at least 4 feet, to 7 feet, that’s what I use most of the time. MWO: Give us a few of your secrets for triggering more walleyes with a Roach Rig. Roach: One of my tricks, when I see fish maybe 3 feet or so up off the bottom is to use a longer snell, maybe 7 feet, and an air-injected ‘crawler. All I do then is move along slowly until I see the fish on the locator, then I stop the boat and the ‘crawler starts floating up like a bobber, and it goes right through those fish. And then you kick it in gear and it pulls it back down through the fish. That’s why you go in and out of gear, in and out, in and out, and that thing goes floating up right past their noses, and when you kick it into gear it goes back down again, see. The fish think it’s gonna get away, so they grab it.You gotta use some common sense out there fishing. If you just put ‘er down and troll and keep on going, it’s only going to come up maybe a foot off the bottom at the most, or maybe 6 inches. If you look at your locator, a lot of times you see fish 3, 4 feet off the bottom. MWO: Those would be the most catchable fish most of the time anyway, right? Roach: The ones that are up higher, yeah. But it all depends on how you present the bait to ‘em. If you just kick it into gear and keep going, I mean, you might as well be in the Indy 500, man. You aren’t going to catch any more fish than a race car driver [laughs]. You gotta slow down out there. MWO: You do a lot of thinking while you’re out there, don’t you? Roach: Oh, you bet. And same thing with leeches, too; what you gotta do with leeches is lift your rod tip so the bait comes maybe 4 or 5 feet off the bottom, then I set it back down slowly, and as the sinker hits the bottom, the leech is still up there a ways, and then you let it swim right down. The leech is trying to swim and it’ll swim right down through the fish to the bottom. He’ll swim right in front of the walleye’s noses, and they’ll reach up and pop him. It’s so simple, but people don’t realize it. They don’t think. You gotta think when you’re out there. 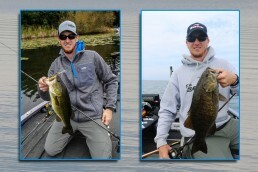 Son of Duane, who is one of the brothers Peterson (with John) that founded Northland, “young” Travis Peterson has been eyeball-deep in all things fishing since before he could walk. He’s been helping with tackle design and promotion his entire life, and is a tremendous bass fisherman. 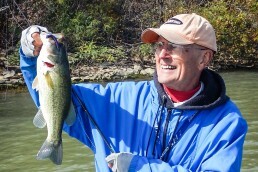 MidWest Outdoors: What is your absolute favorite midsummer bass pattern? Travis Peterson: Shallow water, fishing emergent vegetation. Slop, pads, wild rice, anything like that. I like the visual aspect of bass fishing. I love casting at targets and working around obstacles, and seeing the strikes. MWO: What are the conditions, in your mind, that make that pattern primed to go? Peterson: Calm conditions, for sure. No disturbance on the water makes your lure that much easier for fish to detect and track. And in midsummer, the hotter the better. Those 90-degree days everybody complains about, and bright sun, that drives those fish into the vegetation. MWO: Right, because there’s shade there, and the water is cooler than it is in the open, right? Peterson: Right. It’s a magnet on those hot days. The fish don’t roam as much. They tuck up under the canopy of lily pads and other weeds. A lot of times, it’s a mix of green vegetation. MWO: We might think that, in mid-summer, it’s time to look deeper, but you’re saying that it’s a mistake not to check the shallows? 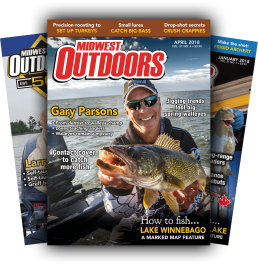 Peterson: Yep, there’s a population of bass that stays shallow, here in the Midwest, during the whole open-water season, provided there’s cover and food. 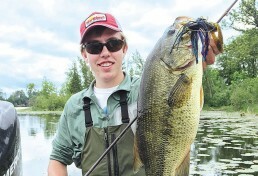 Largemouths are warmwater fish, and at least in the upper Midwest, our lakes don’t burn out. We get water temps in the high 70s, but that’s not too warm for largemouths, especially when they have that vegetation to hide in. MWO: Especially on calm days, you can’t come roaring in on top of these spots and start slamming baits down, so tell us how you approach the spots and start fishing. Peterson: Being stealthy is important. 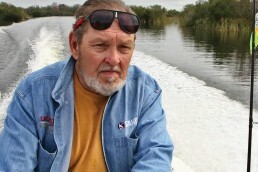 I shut down the big engine a couple casts distance away and sneak up on the edge of the cover with the trolling motor. You don’t want to throw a wake in there on that vegetation. I’ll fish one time through the area, concentrating on the outside edge of the cover, and not penetrate the cover too far, with a buzzbait. I like that Buzzard buzzbait. MWO: Are you casting parallel with the edge, so your Buzzard can stay along the edge for a greater distance? Peterson: I’d call it a 45-degree angle, so it’s paralleling somewhat, but often there are pockets and holes you can reach, too, or a little cut in the cover. So many of our bays have beaver huts in the back, and the beavers will have channels that don’t have vegetation in them, so you can work your bait through those. You just go along picking that cover apart with your casting. MWO: What’s your favorite color Buzzard for this? Peterson: They all work, but I like the white shad color, and black. It’s called Bullhead with the chrome blade and Blackbird with the red-and-black blade. I like lighter colors on bright days and darker colors on darker days. And another one I like is the crayfish color. MWO: Think out loud, paint the picture for us, how do you present that buzzbait? 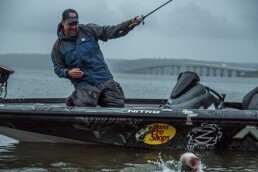 Peterson: I fish it on Bionic braided line, with a 7-foot heavy action rod. I’m casting as far as I can in a lot of cases, although that’s dictated by the cover. If I’m fishing that edge at a 45, I’m casting as far down the edge as I can. Or I sidearm pitch it into little cuts and holes in the cover. My retrieve is steady, and just fast enough to keep it on the surface. The key is to engage the reel as soon as the bait hits the water, so it doesn’t sink too far. Start reeling right away, keep the rod tip high, and just fast enough to keep it chugging away. MWO: When you get it away from the vicinity of the cover, do you speed up the retrieve so you can hurry it back to the boat for the next cast? Peterson: Yep, for sure. With a topwater of any kind, you typically don’t get many bites during the last third of the cast. So you maximize your efficiency if you crank it in and get it back out there, close to or in the cover. MWO: When you get a strike from a bass with the buzzbait, do you tighten up immediately? Or do you sometimes pause a bit before setting the hook? Peterson: It’s pretty much the same as with a frog or spoon; I’ve got the rod tip held high, at about 10 or 11 o’clock, to start with. When I get a strike, I drop the rod tip to the fish as I continue to reel, which picks up the slack. And then hammer back. Those largemouths, especially at this time of year, are so quick you can’t hardly set the hook too soon. You don’t need a pause, but you do need to reel up that slack before you hit ‘em. It’s more a matter of creating a lower angle with the rod to make a hookset. MWO: When you get the hooks into a bass, you need to get its head up and get that fish out of the cover immediately, right? Peterson: You do, and that’s one that can be hard for someone who’s just starting to fish bass in heavy cover. It’s tug of war initially, to get ‘em pulled out and away from that cover. Then you can relax a little bit and enjoy the fight. In the heyday of big-time tournament walleye trails, Eric Naig became a serious competitor, a threat to win any event he entered. Far from a one-trick pony, this versatile angler now heads up sales and marketing for Northland Tackle (when he’s not fishing, that is). On the many trophy muskie waters dotting the upper Midwest, Naig loves to chase these forked-tailed beasts, and offers his best midsummer methods. 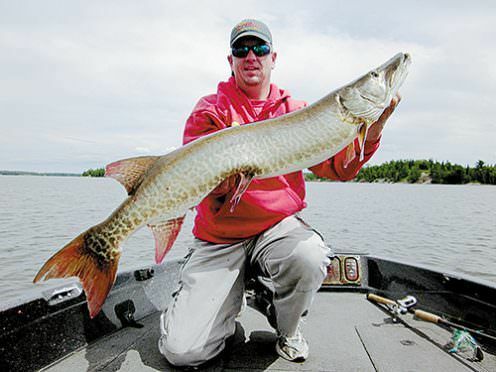 MidWest Outdoors: Today’s muskie anglers are good at spotting high-percentage summer spots. 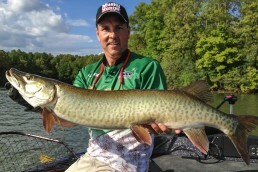 You believe that leads to muskies seeing a parade of popular lures on a continuous basis––which can lead to fish becoming conditioned to them. Tell us why you developed the Bird-Shot Bucktail and how you use it to trick and trigger today’s pressured muskies in those high-percentage locations. Eric Naig: The Bird-Shot Bucktail was designed with a few things in mind. It’s compact, for a smaller profile; and it’s heavy for its size, so you can make long casts and retrieve it fast without having it blow up out of the water. It also has a subtle rattle, and that seems to be another trigger.It’s all about speed and profile. It looks and acts differently than those giant lures, and anything with two spinner blades. It’s all about getting a reaction strike from fish that have seen a lot of lures. I first learned about small bucktails on Lake of the Woods from some old muskie nuts. But the smaller bucktails available at the time were too light to cast far, and you had to reel them slow or the spinner blade would pop up on the surface. Those guys were adding a 1/2- to 1-ounce sinker to the back treble to fix the problem. But we started thinking we should create a small muskie bucktail that did everything we wanted it to. 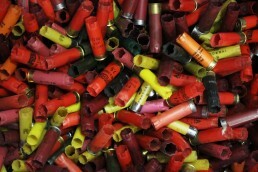 That’s where the Bird-Shot came from. MWO: On the subject of high-percentage midsummer muskie spots, what do you look for? Naig: I love fishing heavy vegetation for muskies, and I find big pike in there, too. Look for places where a variety of weeds come together and become mixed. That’s a good place to start. 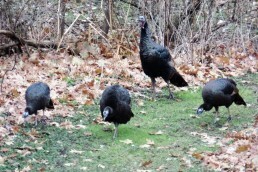 Look for pads, reeds, coontail, and cabbage in the same area. If you also find ‘hard cover’ like rocks and wood, you have the makings of a great spot that will produce every year. And one thing about weeds: baitfish and big predators seem to like clean, green weeds best. I don’t like weeds that have a lot of moss growing on the stems and leaves. Move on if the weeds are dying, brown, or laying down. MWO: How do you fine-tune your search? 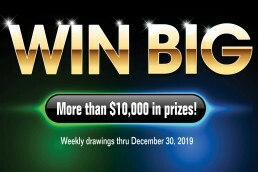 Naig: Pay close attention anytime you see or catch a fish. Where did that fish come from? Think in detail about where it was set up. What type of weeds were dominating that spot? Was the fish on the inside or outside edge of the cover, or right in the thick stuff? 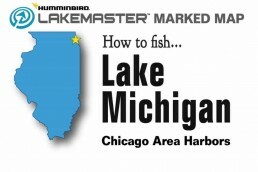 On most bodies of water, if you dial in what kind of vegetation, and what kind of spot that fish was on, you can find other spots like it, and create a very predictable fish location pattern. You can go around the lake hitting your best spots until the bite changes. MWO: What is your approach to fishing each spot? 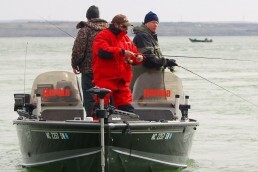 Naig: I focus on making accurate casts and ‘steering’ the bait in and around cover. Pay close attention to what was going on when you get a follow or a strike. 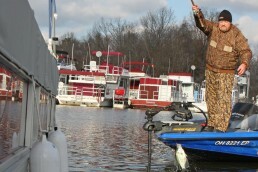 Steering the bait around cover changes the retrieve speed and angle, as the bait approaches and leaves the cover. 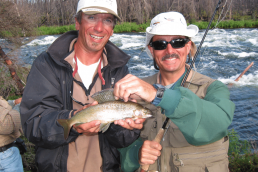 Watching closely can help you pick up on clues, such as maybe the fish want the bait moving faster or slower. MWO: In addition to that smaller Bird-Shot Bucktail, what other lures do you like best for fishing in heavy cover? 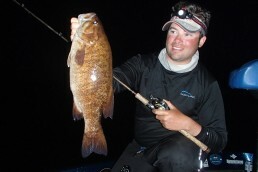 Naig: My favorite baits for fishing all types of vegetation are big spinnerbaits. They are efficient in getting through heavy cover and have a very high hooking percentage. One of my favorites is the Bionic Bucktail, especially in heavy reeds or rice. It has a ‘deep-V’ head design that’s almost like a boat hull. It creates a wake of sorts, and it pushes vegetation away from the hook and blades. It walks and grinds right through the cover, and you get a lot less vegetation on your hook. It’s the most weedless of the big spinnerbaits. It helps you be more efficient than you are with other lures, because you come through with clean casts most of the time.If I’m fishing in stained water, I like to use a silicone skirt (as opposed to Buckhair). The Northland Magnum Reed-Runner is a big skirted spinnerbait with hi-vis colors that get noticed. I love that bait. MWO: What other little secrets can you leave us with? Naig: A couple things. For one, I like to put a small, white Impulse grub, 2 or 3 inches long, on the trailer hook. That white plastic helps me see the lure during the retrieve, so I can be more precise about bumping it into something, or bringing it right along a weed edge or something. That really helps when it’s windy, and during low-light conditions. Another little thing I do that can make a difference when I’m getting a lot of follows but can’t get them to bite: replace the back willow-leaf blade with a Colorado blade. That blade design lets you slow down your retrieve, and creates slightly more lift to the bait. It gives the fish a different look, and sometimes they’ll go on that.